A Caltech-based team are combining micro medical devices with MRI tech to create a microchip that could one day track smart pills inside the body. Their 1.4 square millimetre silicone chip is based on the same technology that allows MRI scanners to map the body's tissues. These huge machines apply a powerful magnetic field that affects the nuclear spin of hydrogen atoms in the body. A radio frequency pulse then excites the spins, and the atoms give off weak radio signals as they relax. Different atoms give off different signals depending on where they are in the field, allowing their locations to be mapped. The new chip, called "addressable transmitters operated as magnetic spins" (ATOMS), has been designed to mimic the MRI spin response of hydrogen atoms. It contains sensors, resonators and wireless transmitters, and is able to detect a magnetic field and the radio frequency pulse, and then emit an adjusted pulse that reveals its location. Though still in early development, tech like this could one day allow the inside of the body to be monitored, and even mended, by futuristic 'smart pills'. "The dream is that we will have microscale devices that are roaming our bodies and either diagnosing problems or fixing things"
A research team at the Universite Libre de Bruxelles have developed a self-healing system of modular robots capable of removing and replacing damaged components. 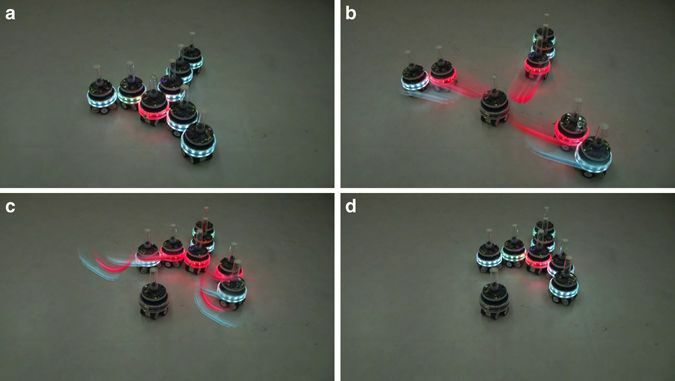 Their ‘mergeable nervous system’ robots, MNS, are made from multiple units that can come together to form one large bot or split to become several independent entities. In each group, one unit - the brain - takes charge of decision making, and the rest become subordinate ‘child’ units. They can split apart at any time, acquiring new brains and making new shapes, and solving different problems. Best of all, if a unit malfunctions, both the brain and its children are capable of detecting the fault and detaching from the damaged bot. They can continue independently, or reassemble with spares around them to create a new, autonomous system. At the moment, the bots only work in 2D, but the team are working towards building a 3D robot network that can reinvent itself and adapt on the fly. Our feline friends have a lot to answer for. Not only have they taken over the internet, they've helped to infect a massive 2 billion people worldwide with a parasite called Toxoplasma gondii. That's almost a third of the total human population. 16 research institutes have come together to work out the impact it's having on our brains. They looked for connections between the molecules the parasite makes, the levels of genetic markers in infected human brain cells, and the brain chemistry of people harbouring the parasite. And they found that the infection can alter 12 olfactory receptors - the sensors that enable us to smell. Though most warm blooded animals can be infected by the parasite, it needs to get into cats to complete its lifecycle. And it does this by altering the way that other animals respond to feline predators, making them more likely to get eaten. Toxoplasma gondii infection makes rodents lose their fear of cats, and chimpanzees their aversion to leopards. Both start to ignore scent signals that would normally turn them away. And it seems our noses are also affected by the infection. The study also found a link with common brain diseases like epilepsy, Parkinson's and Alzheimers. But, the authors are hopeful that their work could now point the way to new treatments. This work provides a systems roadmap to design medicines and vaccines to repair and prevent neuropathological effects of T. gondii on the human brain.